Definition: Rotavirus is a type of infection that causes of diarrhoeal disease among infants and young children. It is a genus of double-stranded RNA viruses in the family Reoviridae. It’s highly contagious and easily transmittable. While it occurs most often in young children, adults can also get the infection, although it’s usually less severe. In 1974, Thomas Henry Flewett suggested the name rotavirus after observing that, when viewed through an electron microscope, a rotavirus particle looks like a wheel (rota in Latin) the name was officially recognized by the International Committee on Taxonomy of Viruses four years later. In 1976, related viruses were described in several other species of animals. Rotavirus is transmitted between hand and mouth contact. If people touch a person or object carrying the virus and then touch their mouth, they could develop the infection. Infants and children under 3 are at the highest risk for rotavirus infection. Being in daycare also raises their risk. A rotavirus infection usually starts within two days of exposure to the virus. Initial symptoms are a fever and vomiting, followed by three to seven days of watery diarrhea. The infection can cause abdominal pain as well. There are nine species of this virus, referred to as A, B, C, D, E, F, G, H and I. Rotavirus A, the most common species, causes more than 90% of rotavirus infections in humans. The rotavirus isn’t treated with medications. It usually resolves on its own with time. However, dehydration is a serious concern. Knowing when to seek medical intervention is essential to prevent life-threatening complications. Diagnosis and Treatment of Rotavirus: Rotavirus is often diagnosed based on symptoms and a physical exam. A stool sample may be analyzed in a lab to confirm the diagnosis. 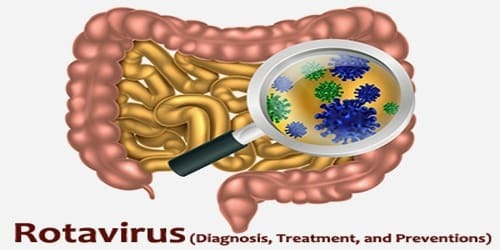 Specific diagnosis of infection with rotavirus A is made by finding the virus in the child’s stool by enzyme immunoassay. There are several licensed test kits on the market which are sensitive, specific and detect all serotypes of rotavirus A. Other methods, such as electron microscopy and PCR (polymerase chain reaction), are used in research laboratories. Reverse transcription-polymerase chain reaction (RT-PCR) can detect and identify all species and serotypes of human rotavirus. There’s no specific treatment for a rotavirus infection. Antibiotics and antivirals won’t help a rotavirus infection. Usually, the infection resolves within three to seven days. Take Pedialyte or other fluids with electrolytes (especially important for children). Eat a diet of bland foods, such as white toast and saltines. Avoid sugary or fatty foods as these can make diarrhea worse. Hospitalization is only required for infections that have caused severe dehydration. This is especially the case in children. The doctor will administer intravenous (IV) fluids to help prevent life-threatening complications. In 2004, the World Health Organisation (WHO) and UNICEF recommended the use of low-osmolarity oral rehydration solution and zinc supplementation as a two-pronged treatment of acute diarrhea. Some infections are serious enough to warrant hospitalization where fluids are given by intravenous therapy or nasogastric intubation, and the child’s electrolytes and blood sugar are monitored. Preventions and Vaccines: Rotavirus is highly contagious and cannot be treated with antibiotics or other drugs. Because improved sanitation does not decrease the prevalence of rotaviral disease, and the rate of hospitalizations remains high despite the use of oral rehydrating medicines, the primary public health intervention is vaccination. Vaccinations are the best way to prevent rotavirus, especially in young children. People can also help prevent spreading the infection by washing their hands frequently and particularly before eating. Rotarix® (RV1) is given in 2 doses at ages 2 months and 4 months. Clinical trials of the vaccine detected no increased risk of intussusception. Both of these vaccines are oral, which means they are administered by mouth, not with an injection. There is no vaccine available for older children and adults. Although the rotavirus vaccine can help, no vaccine is 100 percent effective in preventing future infections. 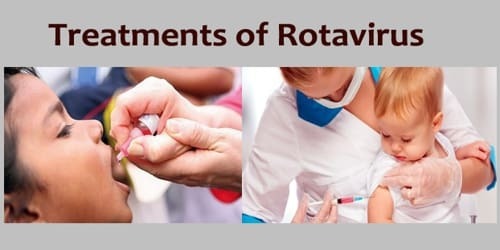 Rotavirus vaccines are licensed in over 100 countries, and more than 80 countries have introduced routine rotavirus vaccination, almost half with the support of Gavi, the Vaccine Alliance. 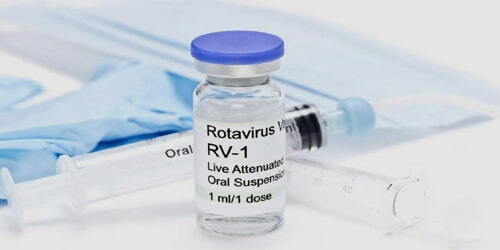 To make rotavirus vaccines available, accessible, and affordable in all countries—particularly low- and middle-income countries in Africa and Asia where the majority of rotavirus deaths occur, PATH (formerly Program for Appropriate Technology in Health), the WHO, the U.S. Centers for Disease Control and Prevention, and Gavi has partnered with research institutions and governments to generate and disseminate evidence, lower prices, and accelerate introduction.